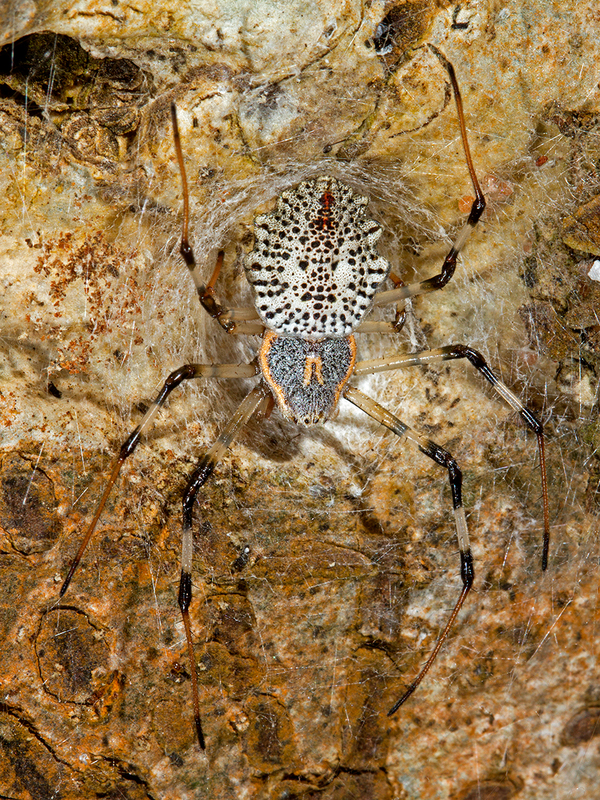 Meet the female Ornamental Tree Trunk Spider, one of many such residents of a living city. You can easily miss this little beauty, which can be well camouflaged against the bark it rests on. Interestingly, the “living city” is a bunch of dead cells! 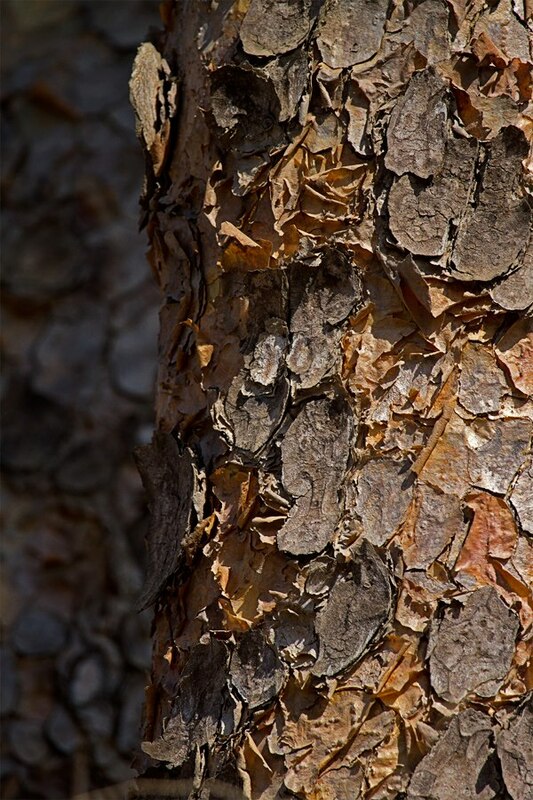 The outer bark is the layer protecting the inner tissues and the living parts within a tree. Every bark is so different from the other. For example, the rough texture of the Crocodile Bark tree (Saaj or Matti or Sadar) is helping the Monitor Lizard stay put. I had once go ne on a survey inside the forest along with a guide who is a Jenu Kuruba tribal and an expert on trees. He told me how the Matti stores water inside and how they would collect it, to quench their thirst in summers! 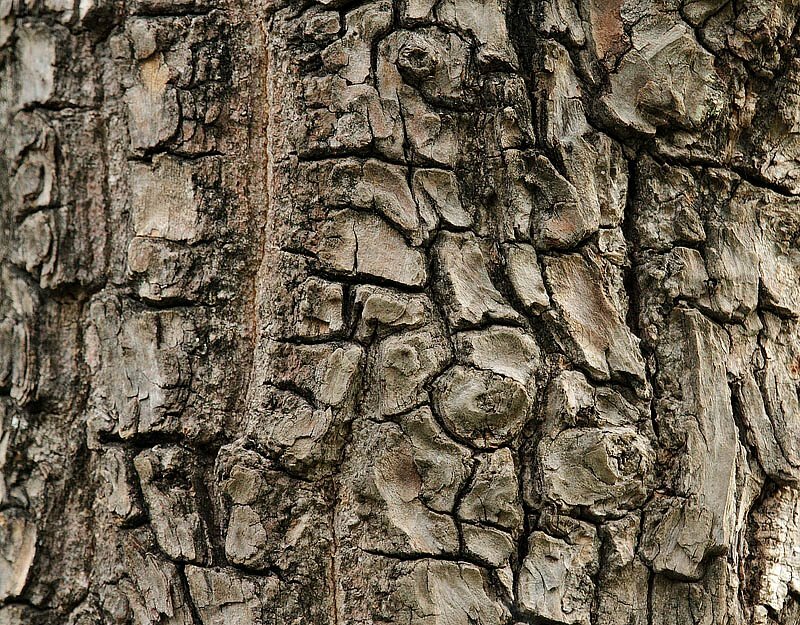 The bark has a characteristic pattern, in case you are still wondering how the tree gets its name. 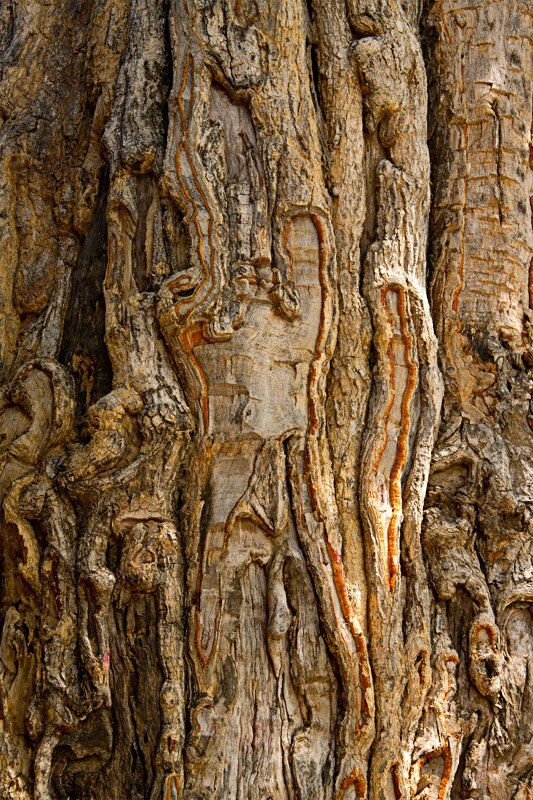 It is a fascinating pattern, one of my favorites and hence, gets to the top of my list of the art of bark. While an entire tree is magnificent, every part of it is even more magical, like the bark, which presents art in its patterns. I observe it as a pastime, or when we are waiting for something else. 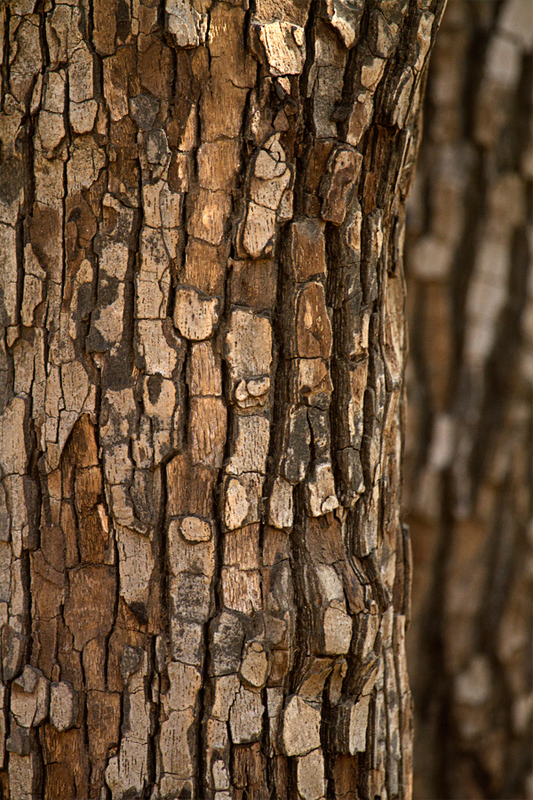 While waiting for a tiny bird to come back to its tree-home, a bark design caught my eye in Gir forest. Our guide identified it as the Guggul tree. Its gummy resin (gum guggulu) is commonly used during Poojas. They typically use it over hot coal, similar to how we use Sambrani. Wiki says Guggul is over-harvested, to the extent of getting an entry in the IUCN Red List. While we were in Bidar, we saw Boswellia serrata belonging to the same fragrant family as that of Guggul. I touched the tree and my fingers stuck to each other, because of the fragrant resin (used in Dhoopa). I continued my queries to our pan-chewing guide. “Oh, this is the Tendu tree. 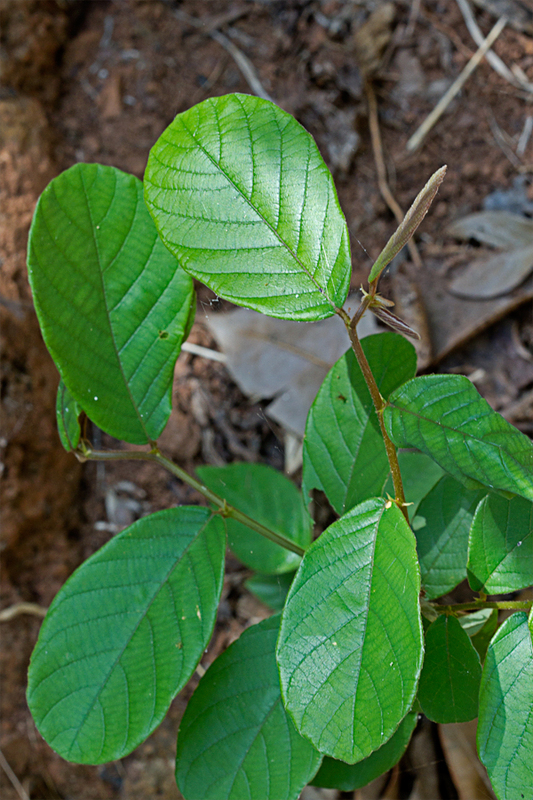 They use the leaves of the Tendu to make beedi. The langurs and the deer feed on the berries which taste very much like the chikoo.” Yummy! I quickly took a couple of images of Tendu, also known as Coromandel Ebony or East Indian Ebony (Diospyros melanoxylon). I uploaded it on our Flickr page with a CC-by-nc-sa license, as usual. An indie game developer found it, when trying to find some reference pics for tree texture! He embedded a cropped and heavily edited version of this image inside a game, which took part in an online “game jam” organized by the Oculus VR company and IndieCade. Can you spot the Tendu in this video of the game being played: youtu.be/kQ6yBjmRGJQ ? Our Tendu went gaming 🙂 But that wasn’t all. Sasan Gir, Gujarat, had more in store for us. It was a joy to just sit in the forest and listen to the silence. But we were snapped out of our reverie. 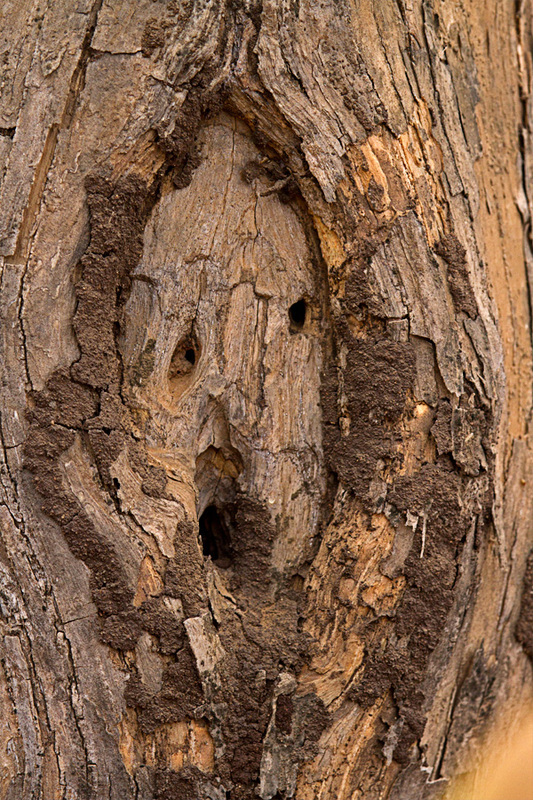 It was a scream; a teak tree’s scream. The pattern reminded us of Edvard Munch’s painting “The Scream”. The expression, the positioning of the eyes, the hands, the mouth – all eerily similar. Was the teak speaking for all other trees ? A tree at Lepakshi seemed to show the sign of the horns; Rock and Roll or The Devil’s Horns or maybe just the finger. There is all this and much more in just a bark. You only need to see. You might see abstract art of the bark or you might see a living city. It was a rather humid day. We were dripping with sweat, and we were not even walking fast. 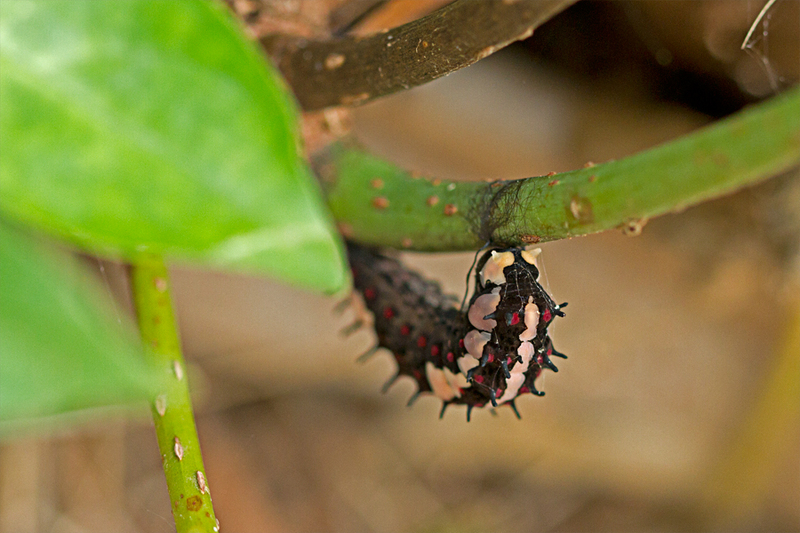 Along the path, we stopped to see this colorful caterpillar, which would ultimately turn into the Common Mime butterfly. But this one wasn’t there yet. It had some more eating, growing and shedding to do. 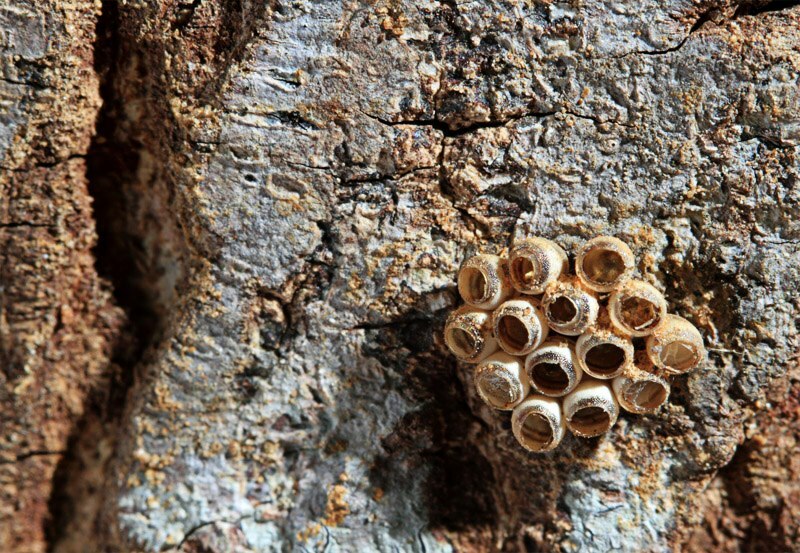 When the mother lays eggs, she chooses plants on which the caterpillars can feed (host plant). Different species of butterflies have different host plants. The caterpillars do complete justice to the feeding! They eat the leaves, munching their way to grow bigger and bigger. In fact, grow is an understatement. They outgrow and shed their skin. The shedding of the skin is called moulting and the skin left behind is a ‘moult’. This colorful bright one had probably moulted twice or thrice before and was now in this form, all in black and orange, with white patches. We reached the bridge and were about to head back. Seeing the voracious feeder had made us hungry. It was then that we saw what everyone had almost missed – two fat and bright caterpillars. A quick check confirmed that they were indeed what we believed them to be – caterpillars of the Common Mime butterfly, very different from the other one, which was a much ‘younger’ caterpillar. We found the black-orange-white moult next to one of them. They eat the moults, by the way. If this change was dramatic enough, the transformation to a Common Mime pupa is phenomenal. The Common Mime butterfly is a ‘harmless’, palatable butterfly, using mimicry for protection. It resembles either the Common Crow or the Blue Tiger, both unpalatable butterflies, and in turn, ‘visually cheats’ its predators. However, its pupa uses camouflage for protection. We were all set to witness this transformation. The excitement was too much to handle, but we had to wait. The Common Mime usually chooses saplings with fresh leaves and lays its eggs on the surface. These caterpillars were on the leaves of Alseodaphne semecarpifolia (known as Mashe / Nelthare / Karuvadi in Kannada). The caterpillars munched on the light green, fresh leaves and got plumper by the day. A few days passed after which the munching seemed to have stopped. They had moved on from the surface of the leaves to rest. One was on a stem and the other was on a twig. These pre-pupatory caterpillars slowly changed their posture and appeared ‘bent’. Many hours passed. It was 5:30 in the morning; all of a sudden the transformation was there for us to see. We missed the very first bit, but the rest was no less fantastic. 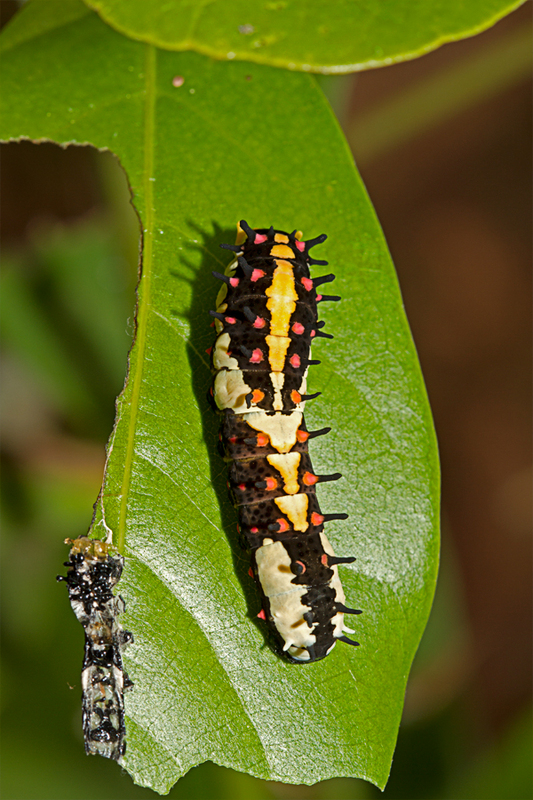 Click here for a short video of the transformation from caterpillar to pupa stage. There, in front of our eyes, was a bright caterpillar, twisting, wriggling, squirming and transforming to a ‘burnt and broken twig’! The pupa stood suspended from the twig with a silk girdle. It was like seeing a graceful trapeze artist hanging. Camouflage is a widely used survival technique by many adult butterflies. This is one of the cases where a pupa uses camouflage. It looks like a dead twig with the top broken off irregularly. It is black, brown and blotched all over. To add to the ‘effect’, the bottom segment appears as it is growing out of the branch or twig! A perfect camouflage, one of nature’s many wonders. We got to see two moults of the caterpillar and also its transformation to a ‘twig’. It has been one of the most fulfilling experiences in our lives. The sheer genius of the camouflage speaks for itself. Many thanks to Karthik M V, Vijay, Ravi and the staff of River Tern Lodge, Bhadra.